Today, I wanted to unpack a piece from my conceptual portraits series I’ve been working on since beginning of last year, titled “Legacy”. The script scrolling from her head at the top right reads “I fear being ordinary most of all”. For this piece, I had been thinking a lot about how many decisions we make are rooted in a fear of mortality. We fear that once we are gone it won’t matter… we will have left nothing behind to be remembered by. We long to be KNOWN for something, to be successful at something, for others to know our name. Sometimes we don’t even care if what we are noted for is positive or not, just as long as our existence is eye-catching and out of the ordinary and commands fame and astonishment for good reasons or for terrible. LIke Oscar Wilde said, “The only thing worse than being talked about is not being talked about”. Everything we do, in the relationships we build, the work and pleasure we choose, is leading towards a legacy we hope to build and the perception by which we will be remembered. I used the repeated pattern of the skull and grave markers on her clothing as a motif symbolizing mortality. You will also notice the burning city in the background at the bottom of the composition, which she turns away from smiling, so inwardly focused that she takes no notice of the external destruction. I have always been interested in masks, mainly because I am interested in almost any form of art that involves faces. Masks can also symbolize so many different things. They can symbolize falseness, pretense, anonymity, invisibility, the concealment of sins. But, they can also symbolize celebration, personal expression, the fact that human beings are flexible and multi-faceted and shades of grey – not black and white, and the power we have over who we want to be in our own story. I am especially drawn to the aesthetic of Japanese Kabuki and Noh masks, two forms of classical Japanese musical drama that involve masks and elaborate costumes to aid in telling the story. In Noh, each mask symbolizes a different type of character. 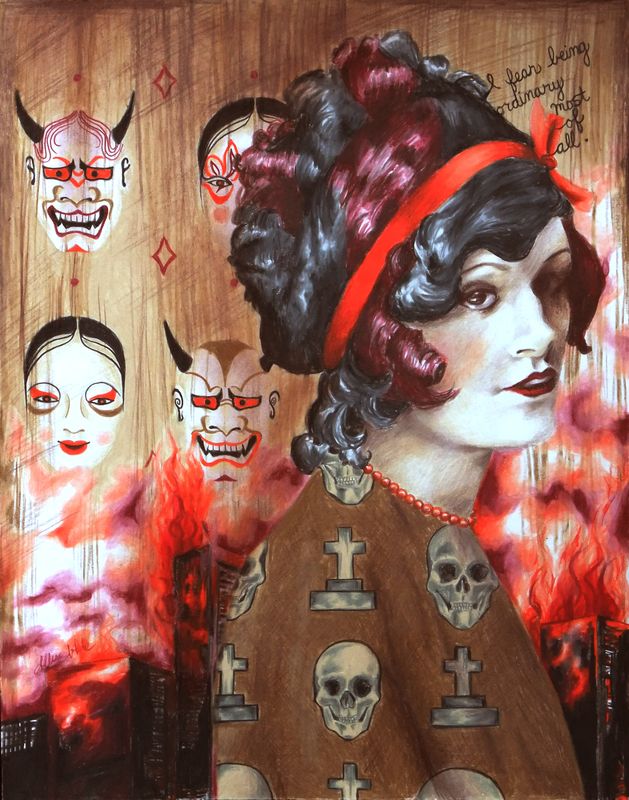 For the background of this piece, I chose to tile the demon character mask (destructive, powerful) alternating with the traditional woman mask (usually symbolizing a character who is beautiful, refined, elegant, and demure). This symbolizes the interplay between a person’s two choices (or more accurately, what we perceive as our only two options). Too often we think that the only way to get ahead, be noticed, be outstanding, is to forgo our ideals and do what is best for ourselves and ourselves only. Those who make history do tend to have an awful lot of skeletons in their closet. But does doing what is right condemn us to having to play the role of the mouse smiling and curtsying in the corner? I’d ask you to also look to history (Think of Martin Luther King Jr., the most well known example!) and see that no, that is certainly not the case. It is always interesting to hear others’ thoughts. Who are some of your favorite notable figures who broke the societal assumption of power and success being inseparable from selfishness and violence? What kind of legacy do you want your existence to build?